Co-founder of AC/DC, Malcolm Young, has passed away at the age of 64. Following a lengthy battle with dementia, the great rockstar died with his family beside him. Malcolm had retired back in 2014 due to health reasons, after a long and iconic music career. He co-founded the hard rock band AC/DC along with his brother Angus, back in 1973. It is with deepest sorry that we inform you of the death of Malcolm Young, beloved husband, father, grandfather and brother. Malcolm had been suffering from Dementia for sevearl [sic] years and passed away peacefully on Saturday with his family by his bedside. Renowned for his musical prowess, Malcolm was a songwriter, guitarist, performer, producer and visionary who inspired many. From the outset he knew what he wanted to achieve and, along with his younger brother, took to the world stage giving their all at every show. Nothing less would do for their fans. Malcolm is survived by his loving wife Linda, children Cara and Ross, son-in-law Josh, three grandchildren, a sister and a brother. While thanking all for their overwhelming support and heartfelt ccondolences, the family ask that you respect their privacy during this time of heartbreak and grief. For those wishing to send messages to the family please visit the Sydney Morning Herald tribute site for Malcolm Young, which will be available later today. The family have asked instead of flowers to send donations to The Salvation Army. With enormous dedication and commitment he was the driving force behind the band. As a guitarist, songwriter and visionary he was a perfectionist and a unique man. His loyalty to the fans was unsurpassed. As his brother it is hard to express in words what he has meant to me during my life, the bond we had was unique and very special. Loyal fans have taken to Twitter to pay their respects to one of the most famous and talented rhythm guitarists in the world. R.I.P. 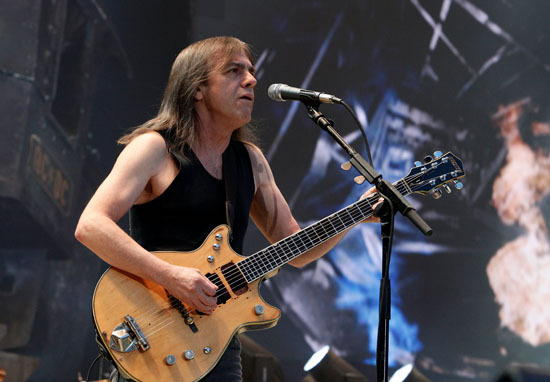 Malcolm Young what an amazing talent and responsible for so many incredible songs. One of the best rhythm guitar players of all-time. His work with @acdc will live on forever. Another legend gone to join the rock party up in the sky. You can make a donation to The Salvation Army in memory of Malcolm here. Our thoughts are with Malcolm’s friends and family at this difficult time.